Overview - A professional karaoke hustler reconnects with his daughter and a bored suburban businessman turns outlaw karaoke singer, among other plotlines. Yes, Patrick Bateman. Yes I do. While their "undisputed masterpiece" might be "Hip to be Square," it turns out that front man Huey Lewis has talents that extend far beyond the musical realm. In 'Duets' he not only sings, but he acts! As undeniably awesome as that might sound, the results are quite disappointing. Another entry in Mill Creek Entertainment's recent wave of overwhelmingly mediocre, forgotten, seemingly unwanted catalogue titles, the film features a decent ensemble and a few inspiring moments, but fails to really come together. With a mishmash of tones that never gel, the movie's comedic elements aren't particularly funny and the drama feels forced and unoriginal. The karaoke musical numbers are pretty solid, but even the "clear, crisp sound" of Huey Lewis' trademark voice can't save the flick from its by-the-numbers plot and thin characterizations. The story follows three separate, disparate duos as they try to find common ground through the awe inspiring magic of… karaoke. Ricky Dean (Huey Lewis) is a karaoke hustler (yes, apparently such a thing exists) who discovers he has a grown daughter, Liv (Gwyneth Paltrow), but wants nothing to do with her. Paul Giamatti plays Todd, a businessman who has a midlife crisis and befriends a wandering fugitive named Reggie (Andre Braugher). The last couple features a young underachiever, Billy (Scott Speedman), and a karaoke enthusiast, Suzi (Maria Bello), who is used to offering "special favors" to get what she wants. All of the characters end up crossing paths at a national karaoke competition where they will need to work through their differences if they want to win the $5,000 prize. A musical/roadtrip/buddy film at heart, the movie attempts to offer laughs and insights, but comes up short on both. The three main plotlines are mostly disconnected from one another and none of them end up getting enough screen time to truly develop into anything worthwhile. The major dramatic beats and characterizations are all fairly standard and cliché, an dialogue can come across as a bit unnatural and too on the nose. There is often a sense that pieces are missing from the narrative, and relationships and conflicts go from point A to point B without putting in the necessary on-screen work. Giamatti and Braugher's storyline ends up being the most successful and emotionally meaty, but still feels a little unfinished and undercooked. The ensemble cast is made up of some strong performers, and thankfully they all do a solid job. Huey Lewis' acting can be a little awkward and stilted at times, but he still carries a decent sense of charisma. Giamatti is the real highlight and his character's midlife crisis is the most entertaining aspect of the entire film. The relationship he develops with Andre Braugher is also pretty effective, and the pair's amusing chemistry makes them fun to watch. The rest of the cast are fine in their underdeveloped roles, but the usually reliable Paltrow seems a little out of place as the naïve Liv. Extended musical numbers at various karaoke bars are littered throughout the runtime. Though Scott Speedman doesn't partake in all the singing fun, the rest of the cast provide their own vocals (but apparently Andre Braugher's voice was composited with singer Arnold McCuller). The various numbers and interpretations of songs like "Free Bird," "Cruisin," and "Try a Little Tenderness" are all well done but unremarkable. The film's attempt to shed light on the exciting world of professional karaoke also feels rather half-hearted, and I never really got much of a sense for the culture and allure of it all. 'Duets' ultimately feels rather pointless. The scattered tones and scripting never connect and an abrupt, tragic conclusion feels very out of place and unnecessary. The film is really all over the place and none of its various attempts at humor or drama ever amount to much. Still, there is some entertainment value here, and despite the uneven, often clichéd storytelling, it might be worth a rental to some. After all, it does star Huey Lewis. That's got to count for something, right? 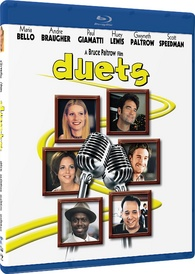 Mill Creek Entertainment brings 'Duets' to Blu-ray on a BD-25 disc that comes packaged in a keepcase. After some logos and warnings, the disc transitions to a standard menu. The packaging indicates that the release is region A compatible. The movie is provided with a 1080p/AVC MPEG-4 transfer in the 1.85:1 aspect ratio. Respectable but unremarkable, the transfer gets the job done without any major issues. The print is in nice shape with a light to moderate layer of grain (though it can look more like noise in some shots). Overall clarity is solid but finer details and textures tend to be a bit murky and indistinct. A few shots also exhibit a slightly fuzzy quality. Colors can look a bit washed out and even though certain scenes feature a nice sense of vibrancy, the hues never really offer much pop. Likewise, depth is on the flat side and black levels look a tad elevated in some shots. Marginal edge enhancement is also visible in a few early scenes, but this wasn't a major issue. 'Duets' looks just fine on Blu-ray, but doesn't really offer much to get excited about. While occasionally soft and a little faded, the picture seems to be a fairly accurate representation the film's original photography. The audio is presented in an English DTS-HD MA 5.1 track along with a Spanish DTS 2.0 track. Optional English subtitles are also included. The film's initial scenes offer a fairly underwhelming experience, but the mix manages to open up pretty well as the movie progresses, giving the various musical numbers nice range and crisp fidelity. Dialogue is clean and prioritized well, and vocals come through with a pleasing, full bodied quality. Unfortunately, the soundstage can be quite small at times (particularly in early scenes) leading to a very tiny sense of atmosphere. Even in crowded karaoke bars, ambiance is lacking and outside of very faint echoes of music cues, the track stays pretty front loaded. Thankfully, the mix expands nicely as the runtime continues, and some decent directionality and surround effects chime in (crowd reactions during performances, falling rain). Some of the song selections offer decent bass activity but outside of a rumbling airplane and a gunshot or two, low frequencies aren't much of a factor. Dynamic range is on the flat side during dramatic scenes but grows wider during musical sequences. The track is a bit uneven, but 'Duets' sounds pretty good when it needs to. The musical performances are the real highlight here, and these scenes are handled well. Though its previous DVD release actually included a decent assortment of special features, Mill Creek has only provided a trailer here. Theatrical Trailer (SD, 2 min) - The movie's trailer is included in standard definition with Dolby Digital 2.0 audio. 'Duets' is a mediocre roadtrip flick that tries to amuse and enlighten but ends up falling short. The ensemble is decent (especially Paul Giamatti) but the script is far too scattered, underdeveloped, and clichéd. The video transfer and audio mix are both good but unremarkable. Those looking for special features will have to hold on to their DVD copies, because all we get here is a trailer. The flick is very middle-of-the-road and the disc itself is barebones but decent. This is a rental at best.